Tour Charles-Bruneau : Professional Cyclist, Lex Albrecht Savours the Magic of it all. Lex Albrecht is a spokesperson for the Charles Bruneau Foundation and the Inspiration route of the Tour CIBC Charles Bruneau. Translated from oringinal version in French. 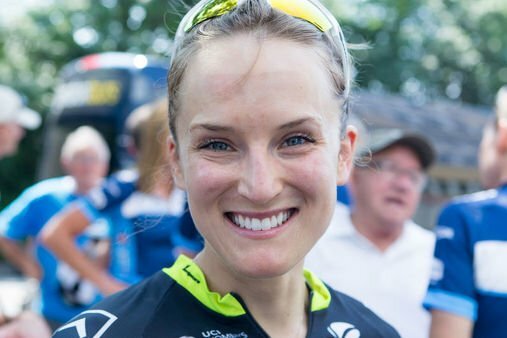 Accustomed to major international competitions, professional cyclist Lex Albrecht is riding in a very different mood this week as part of the Tour Charles-Bruneau. "I have never seen an atmosphere as magical as here," said the one who started Thursday morning in Mont-Tremblant, as part of one of the two-day courses. In a professional peloton, we obviously help each other, but the goal is also to hurt other cyclists, in a sense. At the Tour, there is a widespread feeling of solidarity and even before getting on the bike, we have already won thanks to our involvement. " Albrecht is particularly sensitive to the cause of sick children. The cyclist native of Ontario, (who has been living in Quebec for many years), experienced the drama of losing his sister, Xavea, who was two and a half years old at the time. "It was not because of cancer, but rather a genetic disease," said Albrecht. I did not experience the death of a child as a parent, but I experienced it as a sister. She was very sick and we did not know what she had despite the many treatments. That probably explains why it touches me so much to see people come together for a foundation like Charles-Bruneau, which raises money for research that helps children directly, all over Québec. " On April 6th, her birthday, Albrecht was again struck by bad news. This time, his father Jorg was diagnosed with breast cancer. He is currently visiting Quebec, taking a break from the chemotherapy treatments he receives in Switzerland. A thought for her father inevitably accompanies Lex during the CIBC Charles-Bruneau Tour. The various participants in the event, including those from Rivière-du-Loup on Tuesday, will now converge on Boucherville this Friday for the finish and the closing ceremony. We hope to unveil a check that could, like last year, reach $ 3.3 million. At the end of this human adventure, Albrecht will obviously benefit from her dad's presence before turning to Europe for a series of competitions with Tibco-SVB professional training. As a member of the Canadian national team, she is also aiming for participation in her fifth World Championships, in September, in Austria.